[ Henry Dundas, 1st Viscount Melville. ] Autograph Letter Signed ('Melville') to an unknown recipient, commenting on his Indian 'narrative', with recollections of Warren Hastings and Sir Philip Francis. Duncra [ Lothian ]. 24 November 1806. 3pp., 4to. In good condition, each of the two leaves in neatly-trimmed remains of a windowpane mount. Due to illness and the dissolution of parliament he is only now able to 'return the Manuscript you was so good as to send to me. I have carefully perused it immediately upon my return here. I have no alterations or observations to make upon it; the Narrative is clear and the compilation of facts judicious'. Autograph Letter Signed ('Geo. Paulet') to Smith, former Gunnery Officer on H.M.S. Carysfort. 4 July 1845; 3 Upper Eccleston Street, Belgrave Square, London. 12mo, 4 pp, 40 lines. On slightly grubby and creased paper, with a couple of tiny closed tears. Paulet writes that he has been 'saying much in [Smith's] favor' to 'Sir W. Gage' [Admiral Sir William Hall Gage (1777-1864), a member of the Board of Admiralty]. Gage considers the certificate Paulet has given Smith 'of no use to you without your received from the Adm[ira]l. the appointment of Gunnery Officer and that you had better lose no time in applying to me for a certificate for the time that you were actually doing the duty of gunnery officer'. Paulet reckons this 'from the time of Mr.
Autograph Letter Signed to Sir Charles Watkin Williams Wynn (1775-1850), President of the Board of Control. 4to, 3 pp, 26 lines. Discoloured and lightly stained, with a couple of closed tears, but with text clear and entire. Marked 'Private' and docketed 'No. 5932'. An interesting letter, written on the eve of Hastings' return to England from his post as Governor General of Bengal, giving 'the state of affairs here up to the latest moment', everything being 'quiet and prosperous'. Discusses the state of Government Bonds. 'Sir Edward Paget is in the River & will land tomorrow. Autograph Letter Signed to Mark [Bonham-Carter]. 30 August 1978; on Nicolas Bentley's Shepton Mallet letterhead. Barbara Hastings, daughter of the jurist Sir Patrick Hastings, married Nicolas Bentley (1907-78) in October 1934. In the 1940s she wrote a series of children's books which he illustrated. Two pages, octavo. good, but folded twice and with some creases. An important letter, in which she describes the circumstances of her husband's death. She is very grateful for his letter. 'It was an enormous pleasure to have you here with Kenneth and Billie [bookseller Kenneth Bredon and his wife], but do you know I think it was that dreadful fire that killed poor Nick - indirectly. 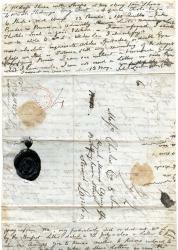 4 Autograph Letters Signed to his barrister, Richard Williams of Lincoln's Inn Field. 22 April 1802, 24 November 1803, 26 December 1803, and 'Wednesday'; all from Harley Street. English soldier, father of Frank Abney Hastings (1794-1828; DNB). The condition of these items is not good: the paper being discoloured, brittle and flaking. A series of intemperate communications. Letter 1 is one page, 8vo, of a bifoliate addressed and docketed on the reverse of the second leaf. It reads: 'I have taken a copy of the enclosed, which I send you, that you may get it written fairly, and signed. I shall be easier when it is done'. Letter 2 is 1 page, 8vo, with the remains of the second leaf of the bifoliate docketed.